Most essential oil or shirt packagings are packaged in black paper tubes and are distinguished from other brands by surface design. Black tube packaging typically uses 300g-450g of gray card as the raw material and 128g of single black paper as the bonding paper. Or the surface can use black leather paper, black pearl paper, etc., to increase the distinctiveness of the packaging, thereby improving the grade of the product. Logo and font printing, we recommend that you use hot stamping or hot silver printing, using bright colors to enhance the brand’s luxury. Judging the cardboard cylinder packaging, mainly the crimping without creases, the slits are flat, and the Cut angle is smooth; at the same time, there is no chromatic aberration during the packaging printing process. In order to avoid errors in custom packaging, we can provide you with free round box packaging samples before confirming the order, ensuring that any details are within the controllable range. It is worth noting that when the paper tube is wrapped, it may be difficult to open the paper cover when opening the paper cover. We recommend that you choose a small hole in the bottom cover that will help open the paper cover. 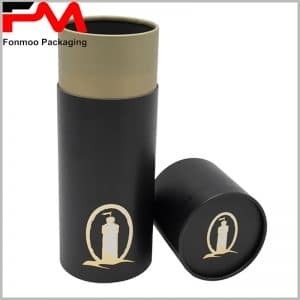 For more black paper tube packaging solutions, you can always contact us and I will provide you with the best service and products.